​A Supreme Court appeal is argued through a brief, which is a written argument that outlines the issues to the court and provides legal research and analysis to support the assertion that there was a problem in the case that needs to be corrected. There are laws that dictate every aspect of what is required to be in the written brief. This includes the page length, the format, section headings and even the acceptable fonts to be used in the brief. Attention to detail is critical in a brief to the Supreme Court of South Dakota. ​In a small minority of cases the South Dakota Supreme Court grants oral argument in the case. This means the attorneys and lawyers get to explain and argue the case orally to the justices. Once all of the information is submitted to the court by both sides the court will take the case under advisement and issue its ruling at a later date. 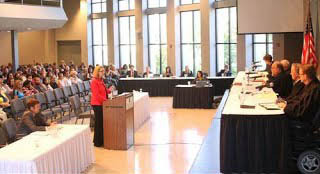 Nicole Laughlin argues a case in front of the South Dakota Supreme Court in 2011.